The word attar, atr, ittar or othr comes from the Persian word itir meaning fragrance, scent or essence. Today attar refer to an aromatic oil distilled either by steam or hydrodistillation into a sandalwood essential oil base. Attars are traditionally distilled in India. India has a deep and intimate relationship with botanical scents and perfumes as well as spices, incense, aromatic oils and flower garlands used for ritual and as offerings. Even when used for cosmetics or cooking, there is always sacred intention. The oldest known still for aromatic plants was found in what is now Pakistan and dates to at least 5000 years ago. All our attars are distilled in India. As far back as 1526, the Mogul emperors of India blended their Persian roots with Indian culture in art, music, architecture, poetry and perfume. They were among the first to distill roses for essential oil and make and use attars. Attars were used daily as perfume and in baths. In the Moghul empire, Maharajas—the nobility of Rajasthan and pillars of the Indian Empire—enjoyed refinement in all domains of their lives, including scent and perfume. Attars became one of the central crafts for this noble population. Indian aristocracy used attars to perfume their skin, hair and clothes. Attars were also highly regarded for their healing qualities and featured prominently in ceremonies and festivities. Attars are mentioned in the Charaka Samitha, an ancient Sanskrit text on Ayurveda. It dates back prior to the 2 nd century and was one of the two foundational texts written on traditional Indian medicine. Attars were considered spiritual perfumes and used in sacred rituals and other religious ceremonies and practices. Kannauj, a small town in Utter Pradesh, India is known as the “attar capital” of India. We buy our attars directly from Kannauj. The history of attars is directly associated with the history of the town of Kannauj. Kannauj has been known for its natural attars since at least the Moghul period. Although it is not sure exactly how Kannauj became the attar center of India, it is thought that it developed during the reign of Emperor Harshvardhan (606-647 AD), a period when Hindu art and culture where thriving. The skilled craft of making attars has been refined over the centuries, although the materials used have remained more or less unchanged to this day. The expertise and production secrets have been handed down from ancestral times through the generations of attar making families. Unfortunately, in recent times, there has been a massive increase in synthetic ‘attars’, because they are much cheaper to produce and most people are unable to tell the difference, since they may have never smelled a real, natural attar, which are getting harder to find in a market flooded with artificial attars. Furthermore, sandalwood production has suffered from sustainability issues. 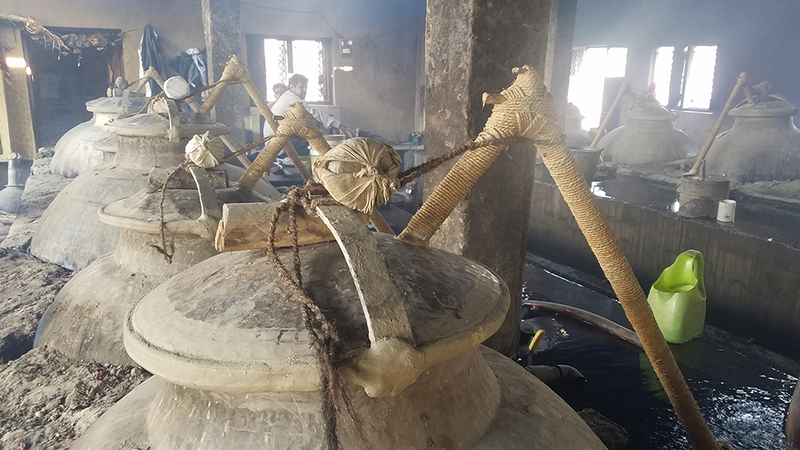 Due to these and other factors, traditional natural attar-making in Kannauj has becoming a dying trade. This is one of the reasons we have chosen to work hand-in-hand, with complete transparency with Moosa Khan and Ali Brothers Perfumers. (1) The Geographical Indication of Goods (Registration and Protection) Act, 1999.